Responding to some vocal minorities in the gaming community, Thomas Puha, Creative Director for Finnish magazine Peelaja, has corrected and jokingly attacked some of the translation issues from a recent interview Puha had with Remedy, creators of the forthcoming Alan Wake for the Xbox 360. 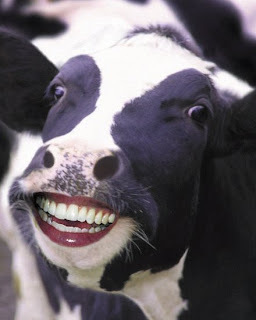 And to keep this update from completely reading like a newsshard, here's a picture of a happy cow. "I wrote the majority of the article with our staff and I’m not happy to see it being mistranslated. There is still an open world, but due to the story the action is more directed to tell the story better as you’d expect from Remedy. You can still go explore the world between missions, talk to npc’s, but the story and the missions are the key things, not open world roaming in the woods." In other words: it's sandboxy, just not during "missions" or story-driven moments. I'm glad this was clarified, as the lack of sandbox had me a bit queasy. I'm cool with just narrative from Remedy, as they're talented storytellers, but the news that the game was just story didn't really jive with my fantasy of what the game would turn out to be. Fantasy verified. I got a chance to see the initial build (running on 360 hardware) back at the 2004 E3, and was impressed. At the time, they were billing it as a completely open world game with a seamless storyline. Perhaps reality caught up with them?